Pigweeds are annual weeds in the genus Amaranthus. 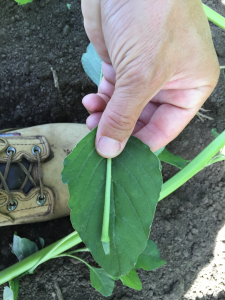 Palmer amaranth and waterhemp are problematic pigweeds that have the ability to develop resistance to commonly used herbicides in agronomic settings. The Report a Pigweed program aims to improve understanding of the location of Palmer amaranth and waterhemp in Wisconsin and where herbicide-resistant populations exist. View the Palmer amaranth fact sheet, waterhemp fact sheet, and the videos below to learn how to identify these pigweeds. 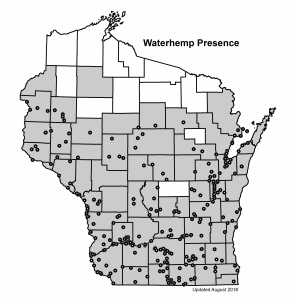 Where are Palmer amaranth and waterhemp in Wisconsin? The maps below show the known populations of Palmer amaranth and waterhemp. While pigweeds pose the greatest concern in agricultural settings, they also grow along roadsides and in gardens, among other places. If you find Palmer amaranth or waterhemp, please report to us with one of the two methods below. Use the Great Lakes Early Detection Network (GLEDN) app. Go to the Google Play (Android users) or the App Store (Apple/iOS users) and download the GLEDN app. Find more information about reporting with the GLEDN app here. One way to find GPS coordinates is to visit Google Maps. Right click on the location of the plant(s) and select “What’s Here?”. A gray marker will appear and the coordinates (in decimal degrees) will be displayed at the bottom of the screen. 2) The habitat where the pigweed is growing: agricultural field (indicate what type of field, e.g. corn, soybean, etc. ), home garden, roadside, or other (please describe). 3) Indicate whether the plant may be herbicide resistant, and if so, what herbicide has been applied. 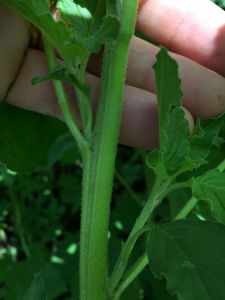 4) Pictures of the pigweed, including a picture of the whole plant, a close-up picture of the plant stem to show it does not have hairs, and a picture of the petiole folded over the leaf to show the size of the petiole relative to the leaf. Thank you for your participation in Report a Pigweed!